With over 200,000 arson attacks on properties in the UK every year, your building is potentially at risk ...and remember over 60% of businesses that suffer a major fire, fail within 18 months of the event - don`t let the arsonist beat you - get the Mailpro Anti Arson Mailbox for letterboxes - two sizes fits all doors! 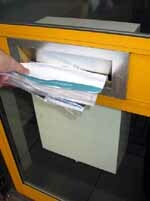 For most premises the letter box offers an easy and inviting target for the would be arsonist. Targets include controversial establishments such as animal testing laboratories, government buildings, schools, shops, offices and even domestic premises. Perpetrators include activist groups, disgruntled customers, criminals out to get even, angry neighbours or just mindless vandals, but in any event, the result of an arson attack can be devastating and each year they cause death and serious injury as well as millions of pounds worth of damage to property. 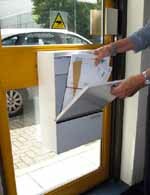 Our MailPro (Mail Protector) range of anti arson mailboxes offer a simple yet effective solution to the threat. They are available in various sizes and each is fitted with one (or two) of our unique sealed for life "ALF" extinguishers. A high percentage of arsonists try a secondary arson attack if the first attempt fails and before Police or Fire response personnel arrive at the scene. MailPro fitted with dual extinguishers offers the added protection of being able to defeat the second attack with the unused extinguisher! The ALF extinguisher is a sealed for life unit which unlike conventional extinguishers does not require an annual pressure test to check it is ok. It consists of a special thermoplastic tube filled with an ozone friendly extinguishant gas stored under a safe pressure Each ALF unit comes with a full five-year manufacturers guarantee (although units over 10 years old have been tested and proven to be operationally effective). The locks used on our Mailboxes typically offer 2,000 different key patterns (differs). Units are normally sold with random key patterns, e.g. if you buy 5 boxes the chances of any one key fitting the lock of another box is 2,000:1. 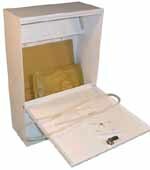 All models are fitted as standard with a lockable access door so that only authorised persons can get to your mail. Each box is supplied with two keys as standard but additional keys and if required `Keyed Alike` lock suites can be provided. The Slimline unit is ideal for use in domestic environments or where the door to which it is attached opens back against an internal wall. The Large unit offers extra capacity for the busy business environment where larger mail deliveries are likely. 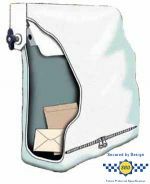 Both models however are designed to fully accept a large C4 size padded envelope so you can be sure that you won`t end up with letters sticking out of your letterbox because they are too long to fit inside.